With the arrival of a baby imminent on the horizon, most women begin thinking about packing a bag for the hospital, making sure the nursery is in order, washing those few last baby clothes in preparation. Me? I began making a list of books to read as soon as we got home from the hospital. 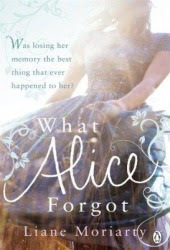 And one of the top books on my list was What Alice Forgot by Liane Moriarty. I've seen this title and author batted about recently, and Chachic's recommendation bumped it up to the top of the list of post-baby reads. With its June 2nd U.S. release date, it seemed the perfect one to start with. My excitement to read it even managed to penetrate the fog of sleep deprivation that exists around my mind these days. I've read Liane's sister Jaclyn Moriarty's work and enjoyed a few of them, and I love the idea of writerly sisters. So I was eager to see what Liane Moriarty's writing was like, especially when I found out this one was about a woman who lost her memory. I'm beginning to think I may have sort of a thing for amnesia stories. So much potential therein. For both humor and pain. Especially the pain. But more on that later. Alice wakes up on the floor of a gym unable to figure out just exactly how she got there. It becomes apparent that she fell off her bike during spin class, bumped her head rather hard, and awoke to find herself being rushed off to the hospital by a couple of handsome paramedics, while people she does not know call out to her and wish her well. Poor Alice becomes more and more confused at the doctor's insistence that it is a different year from the one she knows it is, at the inexplicable workout clothing she's wearing, at the disturbing lack of an appearance on her husband's part. What she doesn't want to accept--but what seems to have actually happened--is she lost the last ten years of her life when she bumped her head. And unspeakable changes have taken place in Alice's life in those last ten years. She and her devoted sister Elizabeth have somehow grown apart. Very far apart indeed. Her best friend is consumed with work and sounds actually shocked when Alice calls her to say hi. Her mother has changed inside and out and has taken up with a man she would never have pictured her mother with, not in a thousand years. And, worst of all, she and her husband Nick have split up and are in the midst of a messy custody battle over their three kids. Three kids they didn't even have when Alice last remembers. She was just barely pregnant with their first back then, and she (understandably) finds it unfathomable that that tiny unborn baby is now a 10-year-old girl who is angry at the world because her parents are divorcing. Desperate to find her way back home, Alice sets about trying to pick up the reins of a life she finds utterly alien. You know how you can become so involved in a book that you actually feel anxiety on behalf of the characters? Your shoulders tense up, your brow furrows, and you turn the pages with trepidation for fear what follows will be more than they can bear. That feeling is nothing new to me. And it's usually the mark of a story I'm enjoying immensely. But do you ever read a book that fills you with anxiety on your own behalf? And your concern and the tension in your shoulders and brow are for the characters, certainly, but even more for yourself. And you're up at night imagining the ways in which your life might fall apart were something similar to happen to you. Yeah. What Alice Forgot filled me with anxiety. I was up at night (granted I was up anyway with baby Finn). But even when I stopped reading I couldn't turn off the anxiety of ten years lost. Of a husband you loved yesterday who absolutely hates your guts today. Of having been on the brink of motherhood for the very first time and then being thrust forward into a franticly speedy life full of taking care of little people you've never met before. And doing it all alone. My post-pregnancy hormones may have been completely out of whack, you guys, but wow. This book did not help. Not one little bit. That said, I couldn't put it down. I immediately felt an affinity for Alice and wanted so very much for her to be able to put the pieces of her fragmented memory together along with the shattered pieces of her fragmented family. Cue the pain I was talking about earlier. And the humor as well. Twenty-nine-year-old Alice is a delightful woman, with a great sense of humor and a love for laughter and life. Her observances on the ridiculous predicament she finds herself in are chuckle-worthy and spot-on. Thirty-nine-year-old Alice is a different creature entirely. She is extremely difficult to like. And Ms. Moriarty does a wonderful job of making each supporting character sympathetic, especially Alice's once-carefree and charming husband Nick and her now-careworn and bitter older sister Elizabeth. I loved them all and wanted to wrap my arms around them and just hug them into loving each other again. Of course, it's nowhere near that easy. Unfortunately, the story takes its incredibly sweet time getting around to anything happening, to Alice solving the mystery of her past and actively trying to form her future into one she can live with. She was such a strong character, I thought her perfectly capable of doing just that. And Nick was a fascinating and complicated character in his own right, but we rarely saw him in the present. There were quite a few reminiscences of him ten years ago, but the scenes in which Alice and Nick of today actually communicate are few and far between. As they were my favorites and were so well done, I really wished there were more. In fact, I needed a few more to make the ending truly satisfactory. As it was, it felt abrupt after the lengthy path it took to get there. So overall, a very absorbing read that fell somewhat short for me in its pacing and final execution. For similar and enjoyable reads, I recommend Bachelor Boys by Kate Saunders and Seeing Me Naked by Liza Palmer. You read it! *does happy little dance* I can see why you didn't love it because it IS a little slow in some parts but like you, this book made me think about my own life and how I'd feel if I lost ten years worth of memories. Any book that can make me FEEL as much as this one did is always a good thing, in my opinion. You did a good job of making the book sound engrossing and worth reading...which is funny, because I normally avoid amnesia stories like the plague. But I loved the way you described getting so nervous on behalf of the characters...so even though you caution about the ending being abrupt, this might be one I have to pick up! Holy Toledo, even though you felt a bit at odds with the pacing, the fact that you were so engrossed and involved outweighs any issues that you had; in my mind. I am definitely going to read this one. I must tell you, I am simply amazed that you are able to focus on a book at this point in your life. My mind goes to mush after birth, and initial newborn phase. i agree i would like to have seen more of Nick ~ loved all your thoughts on this. Sounds like a very balanced review to me! I have yet to read it, but it sounds exactly like my type of book. I would have picked up the book just from the cover alone. Lovely. I have been hesitant to pick this up also due to the same new-mommy reasons you mentioned. But seeing as I thoroughly enjoyed THREE WISHES, I'm sure I'll grab it eventually. All these good reviews for this book have me interested. I like the idea of a story that has me worrying about the characters and staying up late! This is one to get one day. Chachic, good point. I certainly felt A LOT! Just wish there'd been more interaction/development with Nick in the present day. Allison, I'd say give it a shot. Man, was I a ball of frayed nerves! ibeeg, I'm glad. I'd love to hear what you thought of it. And I know what you mean about brain mush post-baby. Clarity can be hard to come by, can't it? Nomes, ah, it would be a good one when you're sick. Definitely entertaining and involving. kay, good! Hope you find your way to reading it sometime soon. Tiah, it really is. The U.S. cover is, sadly, nowhere near as lovely as the Australian one. Michelle, you would really enjoy the other two. And I've been meaning to get my hands on THREE WISHES! How are you and new baby boy doing, btw? Janice, yeah, there's something to be said for a book that grabs hold of your emotions that strongly. Deirdra, thanks for the award! That's very kind of you. I'll be sure to stop by.